The sun has been shining this week to provide many opportunities for continued construction on Grandma's addition. 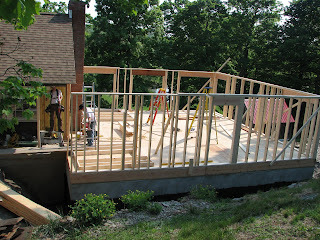 The framing of the house conveys a very progressive feeling of accomplishment. In the meantime, nature continues to do her work. We have enjoyed our first delicious crop of spinach from the garden. 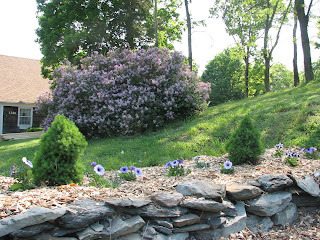 The German Lilacs are in full bloom and the flowers Mom raised from seed are continuing to flourish.